Regarded as the second best place to visit in the Caribbean by US News, St. Lucia is a land of many wonders. Of these many attractions is The Pitons, which happens to be one of St. Lucia’s most famous sites. 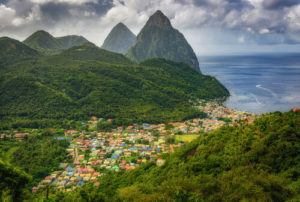 Gros Piton and Petit Piton are the two peaks that make up this breathtaking landmark that has long welcomed mountain climbers and intrigued tourists alike. The Pitons are volcanic plugs and was designated in 2004 as a UNESCO World Heritage Site. Connecting these two impressive mountains is the Piton Mountain Ridge. At the top of this ridge is the Ladera Hotel. This romantic paradise provides an illustrious view of the Caribbean Sea and is one of the few hotels anywhere in the world that is located directly on a volcano. This resort is perfect for honeymooners looking for a unique getaway experience in the Caribbean. For hikers and mountain climbers looking for an exhilarating experience on a tropical paradise, look no further than The Pitons. At 2,438 feet, Petit Piton may be the smaller of the two but it recommended that only professional mountain climbers attempt to climb it due to its rugged terrain. While Gros Piton (2,530 ft) is open to less-experienced mountain climbers, one can still expect a strenuous venture. Travelers who considered themselves fit have said that they struggled climbing this site, so climb at your own risk. For those who would like to take in this site from afar, boat tours are the way to go. Enjoy the view of these high-rising sites while relaxing on the Caribbean Sea. Don’t forget to bring your cameras! You’ll want to remember the day you visited these awe-inspiring peaks for years to come. This beautiful site has something for everyone. From unwinding in the illustrious Ladera Hotel to the thrill of climbing up one of St. Lucia’s greatest sites, you’ll never get bored when visiting The Pitons. Look no further than Dave Charles Taxi and Tours of Saint Lucia to provide you with an unforgettable tour of The Pitons. Located near Hewanorra International Airport, we provide reliable, honest and safe transportation throughout the island that’ll have you begging to stay. Call us at 1-758-715-3573 or use our form online to book a taxi, tour, or custom island adventure!